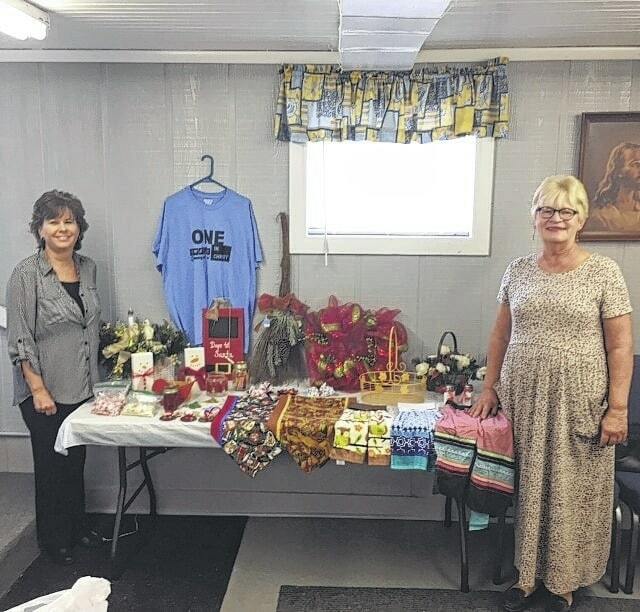 Community of Christ 2237 Russell Avenue West Portsmouth is excited to announce their 34th annual ‘Holiday Bazaar’ on Friday November 4 and Saturday November 5 in the church basement from 9 AM to 4 PM each day. Featured will be many lovely treasures such as kitchen towels, Christmas gifts, fleece blankets, holiday décor, jewelry, etc. along with our hard rock candy in three delicious flavors…cinnamon, fruit and traditional mix. There will be goodies galore pumpkin rolls, pies, cakes, fudge, candy. Coming from the kitchen will be our $5 soup/sandwich lunch which includes hot dog or sloppy joe, bowl of soup (chili, vegetable, potato), cole slaw, chips, dessert and drink. Eat in or carry out. One in Christ T-shirts will also be available for purchase. Most of all we will be serving the best fellowship of the day!! All are welcome. Pictured left to right: Carol McGraw co-pastor of the branch and Vick Bloomfield Girlfriend-n-God’s Women’s Department leader.